Carpet cleaning supply equipment and carpet cleaning machines. 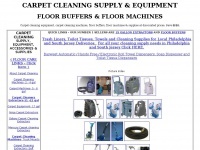 Floor buffers floor machines for cleaners and auto detailers supply carpet cleaners equipment. The websites creator or author is Craig Lapinson http://www.cleaning-supply.net. 2005 - 2007 BMSI http://www.cleaning-supply.net is the owner of the copyright for this website. The web server used by Cleaning-supply.net is located in Fort Lauderdale, USA and is run by Hostway Corporation. On this web server 17 other websites are hosted. The language of those websites is mostly english. Only a few websites on this web server are x-rated. A Apache server hosts the websites of Cleaning-supply.net. HTML 4.01 Transitional is used as markup language on the webpages. Indexing the data of the website and following hyperlinks on it is explicitly allowed by robot information.